Recently, two Medical Metrics Inc. (MMI) thought leaders, Drs. T.J. Mosher and G.E. Gold, contributed their expertise in a review of imaging of the knee in osteoarthritis (OA) clinical trials. As part of a multidisciplinary group who were invited to participate in the Osteoarthritis Research Society (OARSI) Clinical Trials Imaging Working Group, their efforts were recently published in the journal Osteoarthritis and Cartilage and are now available to help guide imaging of OA knee trials. With the previous guidelines for OA imaging in clinical trials published in 1996, the review was sorely needed, as it takes into account recent findings and the introduction of new imaging technology, techniques and modalities. X-ray, ultrasound, computed tomography (CT) and MRI rank among the most commonly used modalities in clinical trials today, although PET and SPECT/scintigraphy have recently emerged as new options to evaluate OA in the knee, the review notes. Depending on the goal of the trial, different positioning of the knee can be explored. For example, for diagnosis of OA in the knee, the standing posteroanterior (PA) position for X-ray is useful. But for trials focused on modifying the disease course, accurate readings of joint space narrowing (JSN) become more difficult in this position. To more accurately capture JSN, the Buckland-Wright method of fluoroscopically positioning the knee has been accepting by the OARSI. While this method is able to capture the narrowest region of cartilage of the medial condyle, not all clinical trial centers are properly equipped to utilize it. Instead, imaging is most often evaluated with anteroposterior (AP) positioning in practice, but for clinical trial purposes, this positioning makes it more difficult to accurately measure joint space width (JSW). 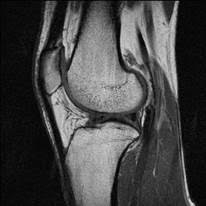 As such, a lateral view of the knee can be employed to supplement images taken on the AP view. According to the review, the lateral PF view is often obtained with the patient lying supine on the table, hips and knees flexed with the heels on the table enough to flex the knees to 45 degrees. In future articles, we will explore more of the review's findings, such as sequence/protocol recommendations and commonly encountered problems. At Medical Metrics, we are proud of the work our thought leaders are doing to advance the field of medical imaging and improve visibility into the best practices for successful medical device clinical trials.